I have been so busy lately, but hey but it is keeping me out of trouble. 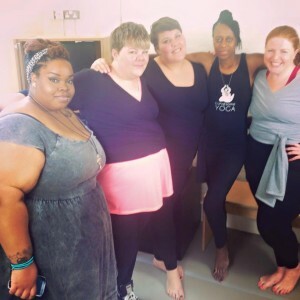 A few weeks or so back, I was able to recorde the launch video for CurveSomeYoga. It was so amazing having the curvy girls in the video. Thanking: State of Mind, Evans and Sukishufu. It was such a fun-filled day for all. So much laughter and relaxation all at the same time. whilst spreading the yoga love. The yoga practice levels ranged from absolute beginner to regular practitioners, but essentially they were all Rockstar yogis. Some were able to come of out their comfort zone, others found they were LOOSER than they thought. A new hashtag was created — in words of Lauren #yolo — (as a result of the yoga high I think). Some have been inspired to renew their yoga practice again. It was just so nice to witness how much they enjoyed the yoga. If you would like to give yoga a try why not attend ‘The Release your inner Yogi’ taking place on 11th July. We will demystify and practice yoga. Early bird tickets will end on 30th June. Tickets available from: http://www.eventbrite.co.uk/e/release-your-inner-yogi-tickets-17386401194. The first 15 tickets purchased will be entered into a prize draw. Look forward to seeing you on a yoga mat soon.